Flagship was formed in the summer of 2002 by Linus Kåse & Christian Liljegren, both of Narnia fame. They both share the passion for symphonic rock in the vein of Kansas, Styx, Buggles & Queen. They realized that very few bands today play this kind of progressive music where melody is the key thing. Lots of ideas came and soon they started to record some demos. They first named the band Windy City, after one of the song titles, but in 2004 it was changed to Flagship. One of the goals for the band is to bring attention and highlight to this kind of music again. The thought is also to keep the band a duo, like the Buggles were in the late 70´s and early 80´s. Flagship are heavily influenced by the melodic prog and hard rock of the 70's, Flagship brings us their debut album. 'Maiden Voyage' delivers music in the vein of Styx, Queen, Slade, Sweet and of course Kansas. Not only do they cover one of the latter bands songs ("Ground Zero"), they also have the legendary guitarist Kerry Livgren from Kansas as a guest on the track. 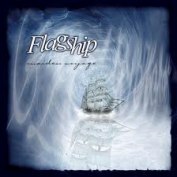 As mentioned in the bio, Flagship is essentially a duo, consisting primarily of Christian Liljegren (Narnia, DivineFire, Wisdom Call, Modest Attraction, Audiovision) and Linus Kåse (ex-Narnia). For this first effort they also brought in noticeable musicians, such as Carl-Johan Grimmark (Narnia, Saviour Machine, Grimmark, Rob Rock), Kristofer Eng (Brighteye Brison) and Mick Nordström (Modest Attraction). Together they deliver a solid album. 'Maiden Voyage' is a throwback to the more melodic bands of the 70's. Imagine a mix of the dinosaurs of the prog-rock movement, and the 70's glam scene. The songs are long (thus there are only 6 tracks on this CD), and the melodies are the key ingredient. Expect harmony vocals, and choir arrangements, fluffy melody lines, and a Queen-like approach to mixing genres. I have to say that Flagship does this very well. All of the songs lives up to the expectations for such a band, and leaves you wanting more. Together they now wished to bring in new elements into the music that they hadn’t tried out before. To capture the sound they wanted, they now had to pick just the right musicians to bring the right chemistry into the songs. Flagship wanted to create a fresh sound and production with the roots from the late 1970´s but with a touch of the new millennium. ?Since the song arrangements are very demanding the line-up had to be top notch, with musicians who’d both understand the feel and essence of the songs as well as technically able to actually perform them. Hence the Flagship team was completed with the help of other proficient musicians. Flagship have signed good record deals with ART UNION in JAPAN for the Asian market and METAL HEAVEN IN GERMANY to push it more in Europe/USA and outside Scandinavia where the album is released by Christian Liljegren’s label Rivel Records. Kerry Livgren ( Kansas) - Guitar solo on track 6.